Meijer Handling Solutions designs, manufactures and distributes specialized forklift attachments and logistics solutions for OEM’s and various distributors worldwide. The company is based in the province of Friesland which is located in the northwest region of the Netherlands and it operates a wholly owned subsidiary in the USA with an office based in the state of North Carolina. MHS takes great pride in being at the forefront of technology for the material handling sector and we’re proud of the fact our solutions have enhanced automotive, food, pharma, manufacturing and distribution operations worldwide. Our customers’ realize and appreciate our willingness to design desired solutions and/or provide special design variations on our standard product offerings. These factors, coupled with high quality, reliability and attentiveness are what sets Meijer Handling Solutions apart from all others. Meijer Handling Solutions aims to add value to our customers’ and end-users’ logistical supply chains. We are the world’s market leader in hydraulic lift truck forks, known as KOOI-REACHFORKS®. Also, we are known for our palletless handling attachments such as the patented ROLLERFORKS® and our unique PushPull systems. Meijer Handling Solutions started as a one-man business in 1921. Like many companies at that time, the company focused on local agriculture. As a result, the company developed into a contracting firm and a bulldozer rental company, which carried out repairs and developed and constructed new machines and machine parts. 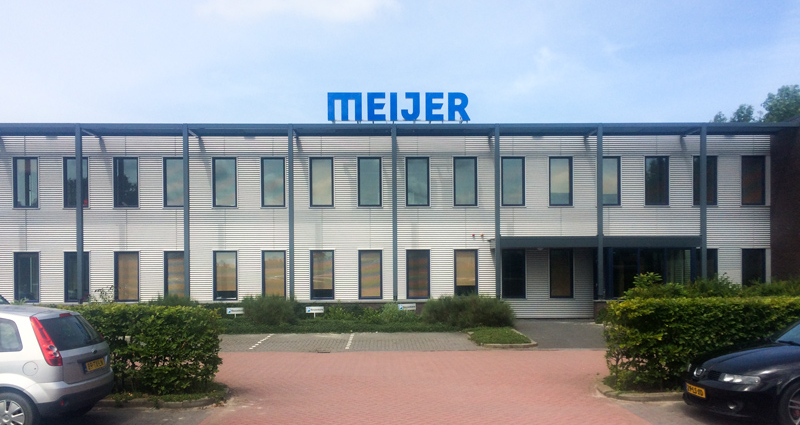 In 1980 all bulldozer activities were ceased but the development and construction of special machines continued to be an important activity for Meijer. Read more..
All products are sold through a network of representatives, forklift producers (OEM-business), and lift truck dealers around the world and since 2013 through our own sales office Meijer Handling Solutions, Inc the USA. We aim to distinguish ourselves from our competition by our specialism and continuing drive for innovative solutions. Also, we carry through cost-saving measures by implementing ‘lean tools’ in our mode of production and seeking intensive collaboration with long term suppliers. These cost-saving measures, in combination with globalization of the market, should enable us to enhance our position as market leader. Over the next five years, we expect to design, manufacture and market even more new products for the logistics sector together with OEMs and/or importers, particularly in the field of palletless shipping, thus creating an even wider product range. We want to work in a dynamic and stimulating working environment in which we are continuously challenged by our colleagues, customers and suppliers in order to improve ourselves every day. We are an independent, innovative company developing and manufacturing logistics products for and with OEMs and importers. Ideally, these products are unique to the market. Our products increase the ease of deployment and application of logistics/transportation resources, such as forklift trucks and their variants. We aim to add value to our customers’ logistical supply chains. We market our products via our own network of importers or directly to OEMs. Our customers find it self-evident that the products we supply are of the highest quality and come with the highest delivery reliability. Exude professionalism and integrity to our customers, suppliers and staff. Provide an open and inspirational working environment to our staff. Expand our network of importers still further. Collaborate with suppliers who are willing to think proactively and are dedicated and transparent. Educate our staff in such a way that improvement is guaranteed at all levels of the organization.